With over 20 years of experience, Elm Consultant & Guy O’Donnell have been at the forefront of elm leaf tree treatment and developing and testing their own safe methods to ensure your trees are saved and blooming like new again. Do you live in Bathurst? What about the surrounding areas of Orange, Lithgow, Katoomba, Cowra and Parkes? There is a new pest in your area in the past 12 months: the elm leaf beetle. This pest arrived approximately 12 months ago and is causing damage specific to elm trees all over Bathurst. While you might not have heard of this better before, you’ll certainly notice its disastrous effects in the coming months. The elm leaf beetle (Xanthogaleruca luteola) is now in your area. The only way to stop this pest is to control the outbreak. These pests spread by vector. Putting them in a bin won’t suffice. This will only help them to disperse. As the name suggests, the elm leaf beetle wreaks havoc to trees by skeletisation of the leaf as it feeds in the larval stage, then as a beetle later on in its life cycle. It lays small yellow eggs that look like miniature lemons, in clusters. It’s crucial to control infestations as both the larva and beetle can significantly compromise your elms. To protect your gorgeous trees, call us. Guy O’Donnell has years of experience as a specialist in the treatment of Xanthogaleruca luteola. Not a general pest controller, Guy’s methods are specific to this particular pest. Coming from an arborist background rather than a pest control background means Guy O’Donnell care about your trees, and using the best methods to minimise environmental impact on the trees while also taking effect on the beetles. What type of insect is eating my elm tree? The elm leaf beetle, otherwise known as Xanthogaleruca luteola, is the culprit. As for the trees they like, European elms and the Japanese elms are their ‘favourite food.’ They’re most active between September through to April, so now is the time to act. First, it’s important to understand their lifecycle. No one has studies the life cycle of these pests more than Guy O’Donnell. Initially, you’ll notice holes in your leaves. As the outbreak is left untreated, the beetles will lay eggs in the trees. One beetle lays up to 20 eggs, so you can only imagine how quickly they multiply. 100 beetles soon turn into 2,000. In the middle of summer, the larvae reach a length of 12mm and can easily be mistaken for a caterpillar. Can you spot foliage damage on your elm tree? The most damage occurs around December which leads to skeletisation of the leaves. The larvae crawl down the body of the tree to pupate on the ground before their next attack. So, what you need to know is there are two generations per growth season, with the potential of a third. There’s nothing more heartbreaking than seeing your gorgeous trees heavily defoliated. 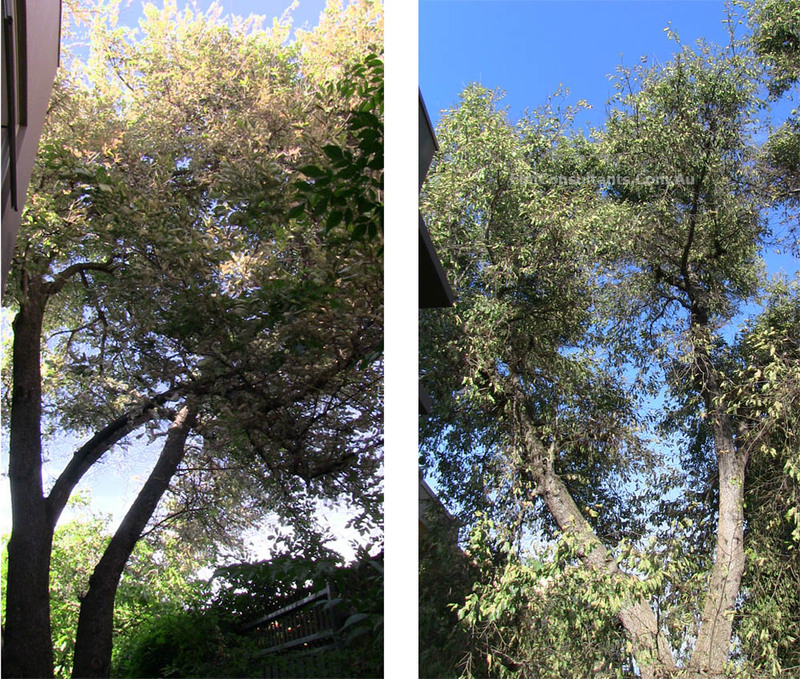 Here are a few of the tell-tale signs that you have a possible elm leaf beetle issue. o You’ve noticed small holes in the leaves. In most cases, the beetles attack the canopy first, asthey travel from the garden and up into the foliage. o Tiny ‘grubs’ on the side of the leaves, approximately 12mm. This is the larvae. They start off black but change to a pale-yellow colour. o You can spot the mature beetles on both sides of the leaf. At this stage, they’re yellow and green, at around 5mm. The aim is to start treatment in winter so we can interrupt their growing cycle and eradicate the infestation before they lay eggs. What’s the best way to treat these tree eating beetles? Currently, there isn’t a solution to biologically control this beetle. The good news is, research continues in this area and with time, this will change. As it stands, stem injections are the best way to eradicate elm leaf beetle issues. Our team are authorised in this area and have since, spoken at industry conferences about best practices. Protect your elm trees. Talk to our elm leaf beetle expert Guy O’Donnell. We use an elm leaf beetle treatment that’s registered in Australia: the ‘Silvashield’. If there’s one detail you take away from this information, it’s to avoid any DIY remedies as your ‘elm leaf beetle treatment.’ Not only is it unlikely to be effective, you’ll also risk serious liabilities. It’s important to work with a company who has a treatment that’s legal, should your tree become damaged by chemical. Sterile stem injections are both safe for your family and the environment. The active ingredient we use (Imidachlorprid), while effective, is harmful to insects. Anything with six legs, we say. We use professional, sterile equipment to control the beetles – a process that cannot be completed by a budding DIY’er. Every treatment is different and we determine a base volume of the insecticide based on the necessary foliage protection. Our treatments will last over two growth seasons. We’ll always endeavour to provide a cost-effective way to destroy the beetles. For every customer we work with, we add details into a database for comparison purposes and to better improve our solutions. In some cases, chemical top- ups might be necessary. This highly-technical procedure requires specialists. There is a great deal of science involved in this process. When it comes to the principle of chemical use, less is more is our mantra. We’re continuously revising our approach, methodology and processes in the use of chemical injections. 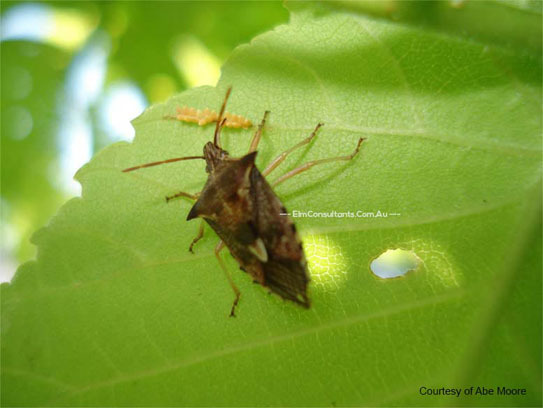 Given that the elm leaf beetle outbreak is becoming a serious concern for residents in Bathurst (NSW, 2795) and surrounding areas, give us a call. Guy O’Donnell is a practising arborist with over 35 years of experience. We’re insured, qualified, and authorised to work with beetle injections. He’s been specialising in this field since 2011. Contact us, your local elm leaf beetle treatment team. Guy O’ Donnell services all areas around Bathurst in NSW to control the spread of the elm leaf beetle. These include, Kelso, Laffing Waters, Raglan, Shiralee, Orton Park, Evans Plains, Windradyne, Plus some major townships where we are beginning to see the first generation effects of the Elm Leaf Beetle, such as, Orange, Cowra, Canowindra, Molong, Mudgee, Katoomba NSW, Boorowa, Parkes, Forbes, Dubbo and Narromine. These are major regional townships within New South Wales, and it is important to call at the first signs of infestation. Guy has also noticed the beetle has infested the third generation in the Southern Highlands of NSW and provides his pest control treatment there also. Be warned, the beetle is coming and pest control is your best option. Call Guy O’Donnell in these regions for the most honest advice and the most in depth knowledge of this pest, and how to best protect your trees. Guy has pioneered cutting edge techniques and knows the best way to treat this problem and also protect your trees.